Electromagnetic waves are in our home and office place, and are present in every environment where alternating electrical current is generated. Visible light represents only a small portion of the electromagnetic spectrum that ranges from ionizing radiation (i.e. X-rays and gamma rays) to non-ionizing radiation – extremely low frequency electromagnetic waves. In reality, between these two extremes, other types of electromagnetic waves are present. These include radio frequencies, infrared waves, visible light, microwaves and ultraviolet light. Electromagnetic waves are also present naturally in the environment: the sun, the planets and the stars all radiate electromagnetic waves which affect life on earth in different ways. Just like other forms of energy, electromagnetic waves have properties such as wave length, amplitude, frequency and power. The energy radiating from a source diminishes proportionally to the increasing distance from the source itself. The growing use of electric and electronic devices such as cell phones, microwave ovens, computers, radio transmitters, electric pylons, overhead power lines and powerful transmitting stations are increasing the level of electromagnetic waves within our environment. Because of this, we face growing concerns about their potentially dangerous impact on the environment and on our personal health. Solution: The answer can only be found by understanding more clearly the properties of electromagnetic waves and their affect on the human body. We at AlphaBio Centrix study of the effects of Bio-Frequency Technology. Most people agree that cell phones emit Electromagnetic Microwave Radiation (EMR). Whether EMR is exposing you to serious health risks, including brain damage is still being hotly debated. The cell phone industry says there is no proof of danger. And yet, years of research suggests otherwise. Studies with mammals show that EMR transmitted from cell phones creates portals in the Blood-Brain Barrier big enough to allow large albumin molecules to pass through and begin to pool around the ganglia of brain cells. Not only does this accumulation of albumin impede intercellular communication in the brain, but researchers are concerned that the portals that will allow such large molecules to pass across the protective Blood-Brain Barrier would also allow a host of smaller, more brain-toxic substances into the brain as well. Cell Phone Radiation: Is It Dangerous? The EMR Defender is made of a material that holds a energetic flux that aids in blocking non-ionization radiation that emits from all electronic devices. Cellular telephones, laptop computers, portable phones, alarm clocks all emit electromagnetic frequency (EMF), or electromagnetic radiation (EMR) that has been proven to be harmful to humans. Summary of the Science: Our research has found that it is possible to cause a molecular variation in organic matter to increase oxygen in the blood. By applying an electrostatic induction field and generating low frequency to the EMR Defender Chip, the chip becomes a delivery device. Since the process is effective in organic material the low energy flux from the EMR Defender carries the frequencies to the cell phone, and other electronic devises thereby helping to block the non-ionizing radiation that emits from those devices. Specifications: The EMR Defender is .50 inches oval with a thick plastic dome for added protection. It attaches to the back of the cell phone or in front of an earpiece phone. Material: The material used for the EMR Defender is made of a hard surface substrate that contains 22.8% iron fragments imbedded in the material that holds the transmitting frequencies. The material is safe and causes no ill side effects. The back of the chip is covered with self adhesive material used when attaching the chip to a cell phone or any electronic device. Frequency range: The EMR Defender is made by generating frequency signals ranging from 30 Hz to 130 Hz. A transformer circuit applies a voltage ranging from 1 volt to 3 volts between arc-shaped conductive plates. These volts cause the material to hold the frequencies to be suspended for up to a three years shelf-life. 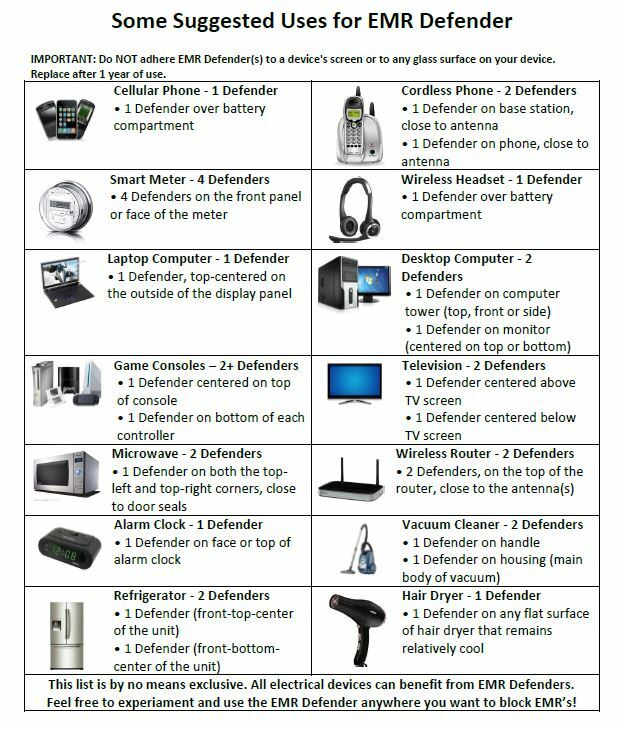 The EMR Defender has a warrantee to last up to one year. ​Contact us at debbie@myjourneytoacure.com for additional information - Please include your phone number.